Quick one, rather than my usual finely-honed prose. I am very busy and am having lots of fun. These are jets. This is what quarks and gluons do in ATLAS. It’s cool. We are writing papers on jet data from ATLAS. I love this, and as I tweeted I am just so impressed by the people I’m working with. From my point of view, being a relatively old fart with a family and job based in London (i.e. not CERN), I am really flattered to be able to help; for the students and postdocs working on ATLAS data right now, it is critically important for them that they succeed and are seen to succeed, if they want to progress in science. They are working like crazy, yet somehow not fighting each other but collaborating properly. A team of superstars. I will just leave any possible world cup analogies hanging there. Also went to this Cosmic Enigma meeting at UCL, gave a talk on the LHC data and enjoyed some great presentations on Inflation, Dark Energy, Dark Matter and things. Now I have data for the first time since I sort of disengaged from ZEUS in 2004, I just love the feeling. Having your own data makes you love everyone else’s data more too (actually this also works with relationships, but it’s probably best not to mention that). For example, neutrinos. 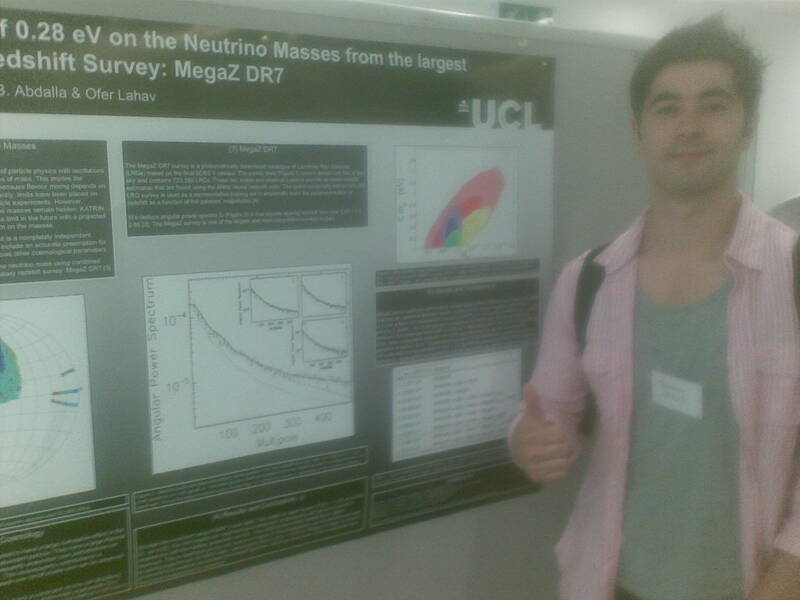 Here’s a bad picture of Shaun standing in front of his poster today which explains how cosmologists get a better limit on neutrino masses than anyone else. I will be very interested to see, once the neutrino mass is measured, which cosmological assumptions they tweak first to get the right answer. It’s really good work though – pushing the consistency of current models until something creaks. Proper science. And they got a good write up on the beeb, which also included the first tau neutrino appearance at Gran Sasso, plus the *really* weird result from MINOS where they see a different mass difference between anti-neutrinos than that between neutrinos. If this is true (currently they quote a 5% chance that it isn’t) then this is an amazing result, which will utterly change our view of the universe (CPT violation, go figure..). I would bet on it not being true, but it is a reminder of how little we know and how much there is to find out about where we live. Then D0 seem to have found CP violation which ain’t in the standard model. (This measurement had major STFC-funded UK involvement from Manchester and Lancaster, but for some reasons STFC didn’t bang out a press release I can find). These things may pass, but right now, to quote Kate Bush, I just know that something good is going to happen. Ok, I don’t *know*. But just saying it could even make it happen. 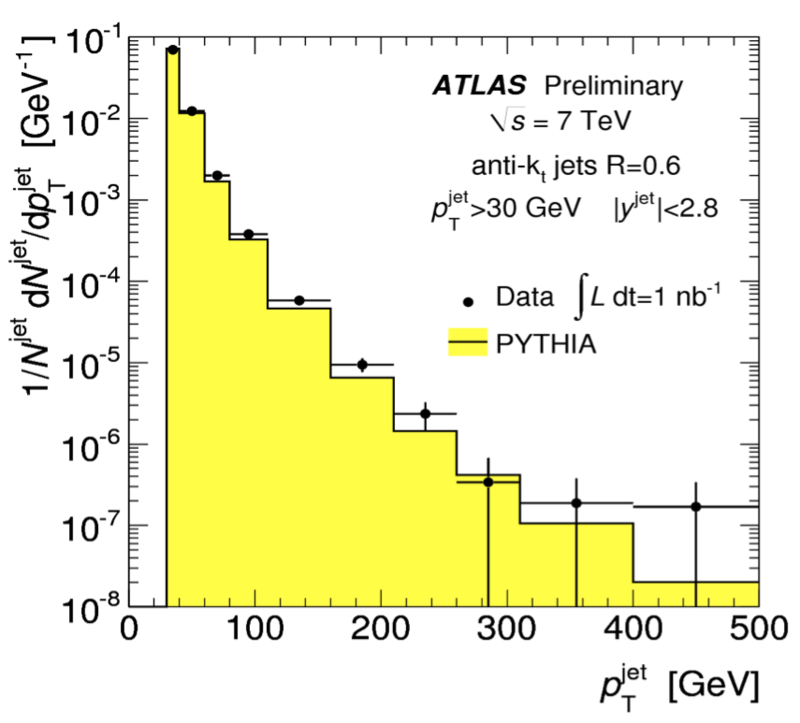 And still the LHC data roll in. I know there was a budget today etc etc. I think we are poorer now. But at least we know some good stuff to do with money when we have it. It’s like my yoyo that glows in the dark. This entry was posted in Particle Physics, Physics, Science and tagged CERN, LHC, Neutrinos, STFC. Bookmark the permalink. Lovely. OK now explain to us what the Figure means (looks at first sight like something close to an exponential distribution). Hah! You fell into my trap…! Am preparing a proper blog post explaining jets, but it may wait until July because that’s when the results I am working on now will go to conference, so I would be able to show them too.